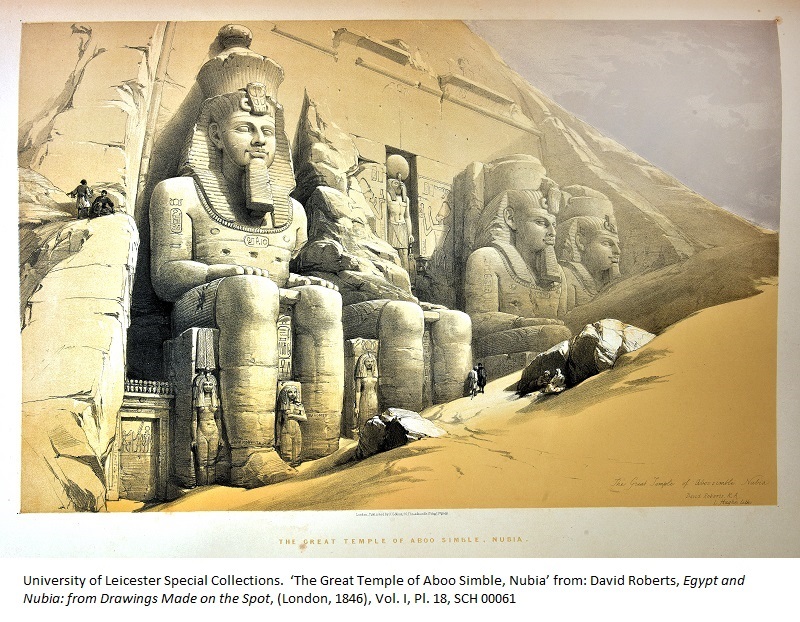 Two hundred years ago, on 1 August 1817, the adventurer-Egyptologist Giovanni Belzoni, described by Howard Carter, with good reason, as ‘one of the most remarkable men in the entire history of archaeology’1 was the first to set foot inside the Great Temple of Abu Simbel, which had been sealed for centuries beneath the sands of the desert. 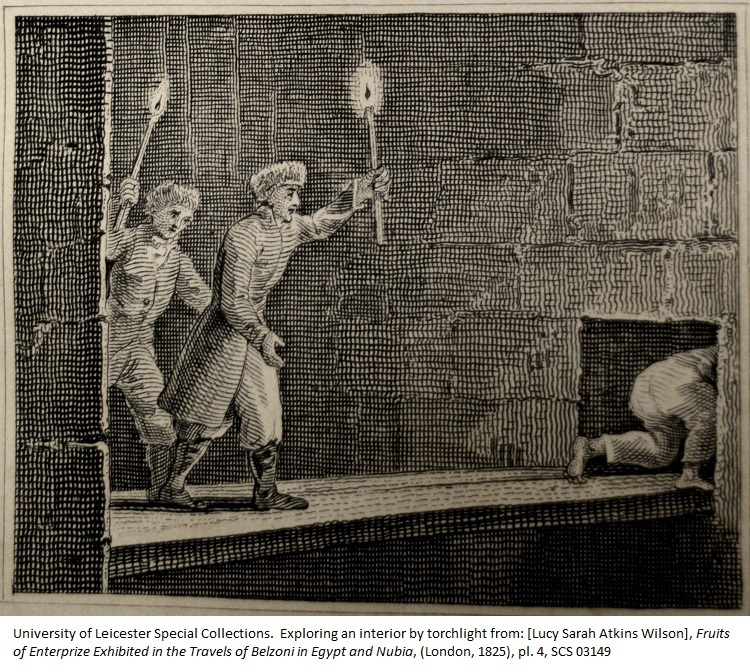 Our forthcoming exhibition, ‘Buried beneath the sands’: Unearthing Ancient Egypt, celebrates his achievement and charts the rediscovery of Ancient Egyptian monuments, temples and tombs during the 19th century, following Napoleon’s invasion of Egypt in 1798. However, it was common practice for 19th century explorers in Egypt to use even gunpowder to blast their way into the monuments (Richard William Howard Vyse at Giza about 20 years later, for example) and to carve their names to show that they were the one responsible for a discovery. 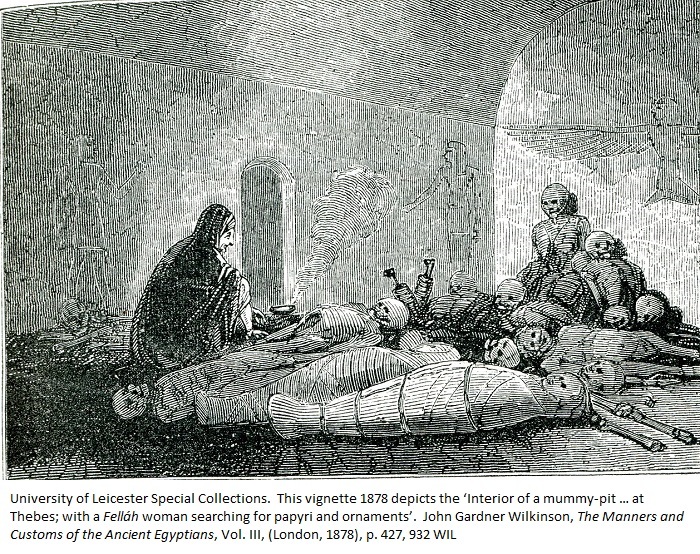 The maltreatment, unwrapping and even deliberate destruction of mummies had been commonplace since the 16th and 17th centuries, when ‘mumia’ was a highly-prized drug, from the sale of which fortunes could be made. He found the colossal statues at the entrance to the temple ‘almost entirely buried beneath the sands. 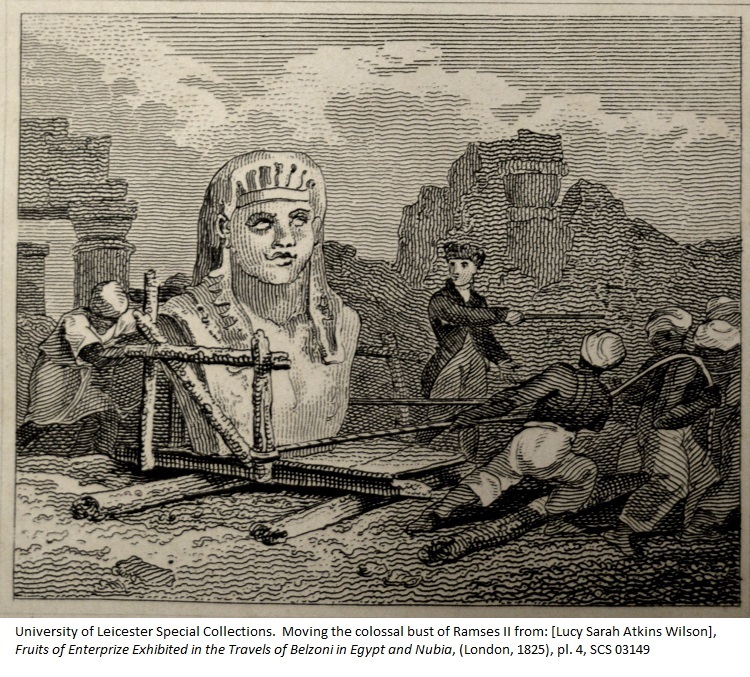 The entire head and part of the breast and arms of one of the statues are yet above the surface; the head of the next is broken off, and the bonnets of the other two only appear’.6 The scale of the task he undertook is conveyed by this David Roberts lithograph. 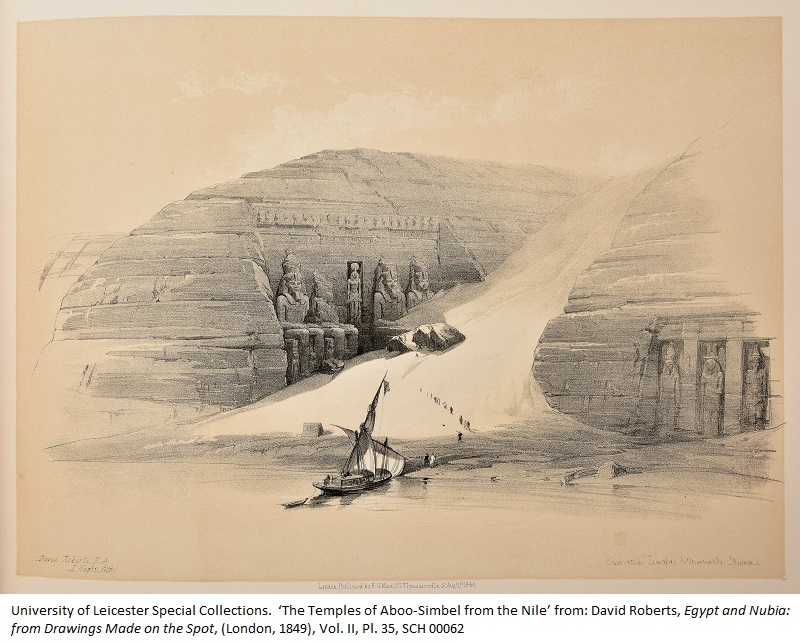 Belzoni documented his discovery of Seti I’s tomb with sketches and over 300 detailed watercolour studies, something that few would have thought to do at that time. Although many of the paintings were by his assistant Alessandro Ricci, some were by Belzoni himself. His Narrative of the Operations and Recent Discoveries …, first published in late 1820, contained 44 plates of watercolour drawings, again some by Ricci but others by Belzoni himself. He was an accomplished artist – yet another facet of this multi-talented man. 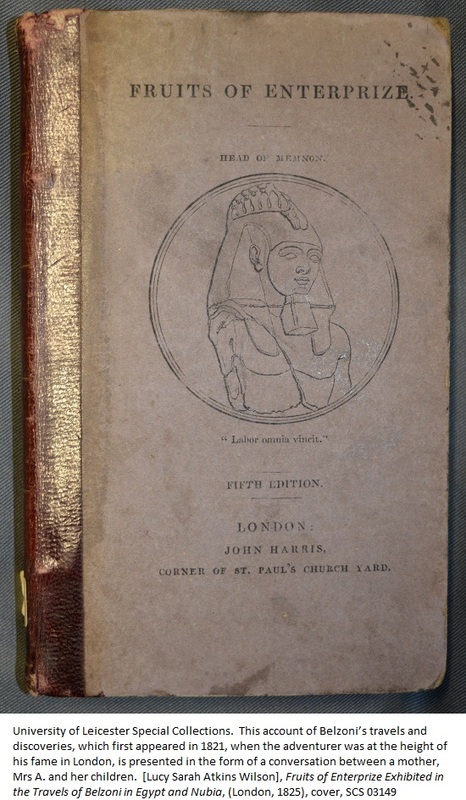 Howard Carter praised Belzoni’s work in the Valley of the Kings as ‘on the whole extraordinarily good’ and judged him ‘of serious and lofty purpose, and imbued with the great desire of bettering the knowledge of the world’7. Belzoni had great physical strength, determination and resourcefulness, a combination which enabled him to work in the searing heat of Egypt and demanding conditions in the field at that time. Somehow or other, he also managed to persuade the local people to cooperate and work for him; this helped him to succeed, where others had failed – in moving the statue of Ramses II, for example. During his time in Egypt, his background in engineering meant that he evolved more effective techniques of excavation and he absorbed much knowledge of the subject. Above all, he had an uncanny instinct for knowing where to look. Howard Carter, The Tomb of Tut-Ankh-Amen …, Vol. 1, (Cambridge, 2010), p. 67 ff.